Walking from Rielves to Torrijos on the Camino de Levante. The Camino de Levante is a quiet pilgrimage route that runs from Valencia, on the east coast of Spain, through Toledo to Zamora, where it joins up with the Vía de la Plata. Andy Delmege, an Anglican priest from England, walked a large portion of the Camino de Levante in autumn 2009. He went from Valencia to Toledo on foot, and then took the train to Zamora. From there, he walked the Camino Sanabrés variant of the Vía de la Plata to Santiago. He kindly agreed to answer my questions about the route and his experiences while walking. Andy: It was my first in Spain. I had done a few week-long group pilgrimages to Walsingham twenty years ago. I wanted a quiet route where I could encounter Spain and I wanted to visit the sites associated with the Carmelite Mystics. Talking it over with one or two people who know the Caminos well and researching on the Pilgrim Forum and the CSJ site decided me that the Levante fitted the bill. On your blog, you described the first few days as “hellishly difficult.” Why was that? The Camino de Levante near Mora, on the way out of La Mancha. I was ill. I had a stomach bug and could not eat. Also the enormity of the task I had set myself as well as being alone (there were no other pilgrims and I was walking solo) hit me. If I could have gone home without anyone noticing, I would have done. There were a few very tough few days. I got some medicine and appetite returned and began to make some impact on the mileage, realizing that I could do this. One important thing was that I promised myself before I started that I would only go home if instructed to by a doctor; this helped me keep with the Camino when things were at their hardest. 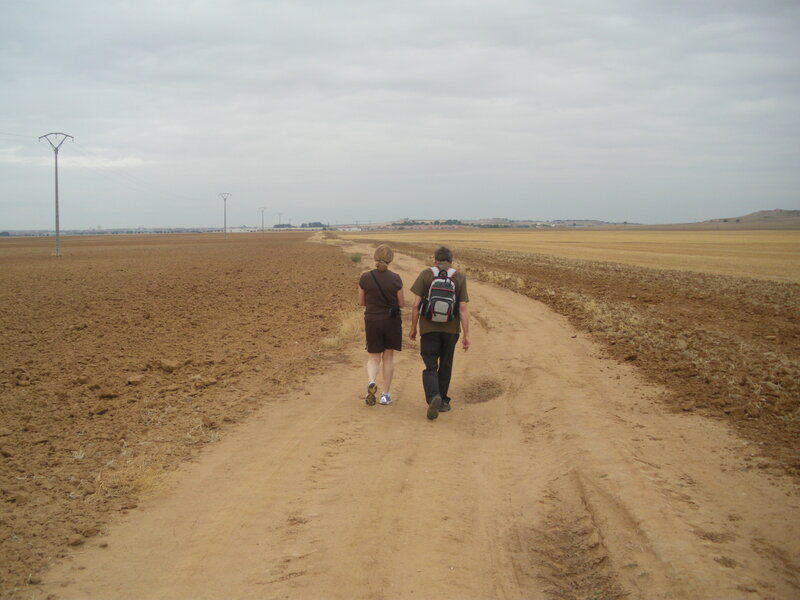 In your article The Walking Becomes the Praying, you write that there were three parts to your pilgrimage: the “empty flatness” of the stretch from Valencia to Toledo, walking and driving with friends in the Toledo area, and then a “more relaxed walk” with more pilgrims from Zamora to Santiago. What was it like transitioning between the different parts of your walk? The first part (which begins with urban Valencia, industrial farming and then some remote hill walking before the flatness of La Mancha) I walked entirely alone. There were no other pilgrims. This was hard but also good. Some friends from home were coming to Toledo on holiday at the same time as I arrived and I decided I wanted company and to spend time with them. We did a little walking, and then visited Avila and Segovia by car. There was no problem transitioning to this—I was looking forward to the company of friends. I then rejoined the Camino, deciding to go take the train to Zamora as this meant I could finish the Camino at a more relaxed pace and in order to meet pilgrims walking up the Vía de la Plata. I was anxious about this but was fine once I started to bump into other pilgrims. I formed close relationships with two people in particular. I noticed you walked with a Spanish guidebook, and I’d imagine there weren’t a lot of English-speakers around on the first stretch. How much Spanish does a pilgrim on the Camino de Levante need to be able to speak and read? I had done a year of classes and had basic conversational Spanish. I think to be able to do this route you need to be able to ask directions, sort out accommodation and the like. I only met one person who spoke English in the first three weeks. What was the accommodation like along the way? There is less pilgrim infrastructure than on the busier routes. There are albergues, but not every day. Some of these are excellent, for example the ones in Algemesi and Las Pedroneras. Others are basic Red Cross shelters. Sometimes it was impossible to find who had the key; other times they turned out to be homeless people’s hostels. It would have been possible to sleep in Sports Centres, but I decided (particularly as I was completely solo) that I would stay in Hostals. I never had a problem finding accommodation. Walking the Camino de Levante. The route sounds like it can be difficult to follow in places. Did you have any serious problems? I gather that the way marking is less good than other Caminos (certainly once I got to Zamora and joined the Vía de la Plata, marking seemed superb). I got lost a few times, but generally just the sort of thing that adds an hour or so onto the day. The strip maps in the Spanish Guide were generally good. I found with them, the arrows and a compass I did OK. Finding my way out of towns was quite often difficult. There were a few times you fell asleep while walking. I didn’t realize that was possible. What was it like? Towards the end of the very long forty kilometre stage between Almansa and Higueruela there was a small straight road with no traffic. I was exhausted and just plodding until I reached the end. Several times I came to, realizing that I had been asleep. There wasn’t much I could do about this. I didn’t want to stop and sleep because I wasn’t sure I’d get up again if I stopped. I suppose it did me no harm! You talk in your blog about the kindness of the Spanish people. What are some of your favourite examples? Walking in afternoon heat, the manager of a farm employing people with learning disabilities told me to wait and then reappeared with a bottle of ice cold water. Some farmers above me on a hill called me over and presented me with a water melon. Several times, stopping in a bar for a cafe y refresco, the owners refused payment because I was a pilgrim. A nun giving me two kilos of home made biscuits. You’ve written a little about the importance of rest days. What was your favourite place for a rest day? I have several. Chinchilla is a wonderful historic hilltop town close to Albacete. I had walked a couple of very long stages to get there and a rest was essential. The parish Church is superb with a beautiful statue of la Virgen de las Nieves and a very robust Santiago Peregrino looking down from the roof. Much later on, I spent a rest day at the private albergue ‘Casa Anita’ at Santa Croya de Tera, a few days beyond Zamora. This was a wonderfully nourishing place. Anita and Domingo were wonderful hosts, feeding us, drying soaked kit and dispensing vast quantities of wine. The Church at Santa Marta de Croya, just across the river, has the earliest statue of Santiago Peregrino and was a place of prayer. I spent a couple of days at Oseira Monastery shortly before Santiago. This small retreat gave me the space to pray through the Camino before my arrival. You say: “solo pilgrimage, although hard at times, can also become self-indulgent.” What do you mean by that? When I am walking by myself my routine, pace, daily mileage, and the like are all about me. I walk and live in ways that entirely suit me. When I walk with others I have to keep other people’s needs in mind too. You say, fairly early on: “I have learned the hard way not to push to much. The two things I am praying for myself are linked to this and to the pilgrim-pace: to learn to be much more relaxed and accepting, and to learn what it is possible for me to do wisely in a day and to accept this. Reliance on God and others in other words.” Was that something that developed as you kept walking? It did develop while I was walking. It was something that I had been thinking and praying about before I walked which affects all of my life, not just the days out walking. The space and prayer of the Camino, along with the practical lessons you can learn on it helped a lot with this (although it is something I am still working on). What I gradually discovered was that the walking became the praying. Alan Ecclestone describes the pilgrimages of Charles Peguy to Chartres: A pilgrimage gets to the holy place at last but what gives it its part in prayer is the slamming down of one’s feet to complete the journey while praying the while for all its features[ii]. In putting one foot in front of another, in the tiredness, in the blisters, in the being at one with myself, the landscape and God, in the mind quietening, in all this, walking, pilgrimage itself, became prayer. The simple goodness of walking and praying the Camino was a falling more deeply into God. The walking became a deeper loving. The incarnatedness of pilgrim prayer, its coming out of kilometre after kilometre, mile after mile of effort, is tested because the Camino is also a School of Charity. I have already written of how generous the people living along the Way were. One important thing for me was to learn to receive it. It can be more testing to learn to live with other pilgrims. Busy albergues can be challenge. Everyone is crowded into a simple dormitory with some showers, facilities for hand washing clothes, and maybe a kitchen. Everyone is tired. Most people want to get an early night. Some people snore. Some people get up to prepare for walking at four in the morning. Dealing with this is an exercise in the practical love that comes out of praying. It is also part of learning basic pilgrim attitudes. These seem to me to revolve around gratitude; to be grateful for the love and care expressed in so many ways, while accepting the difficulties and discomforts with grace. Another key aspect of praying and prayerful attitudes that came out of the pilgrimage was trust. Going off to another country to undertake a challenge that was greater than anything I had done before was a risk. I had to learn to trust myself and my abilities, to trust others (and also to discern when it was right not to trust others), and to trust God. This could be seen, for example, in finding accommodation each night. At home know that I will always be sheltered and comfortable. On the Camino I did not know where I would spend the next night. As I walked, I relaxed and the anxiety about whether I would get a bed slipped away. This is an attitude I must work to keep now. You wrote in your blog: “I do not know what I feel about finishing. I have both loved and hated the Pilgrimage; it has been one of the best and one of the most difficult things I have done. My friend John sent me a text a couple of days ago saying that the benefits will emerge over the next few decades.” How do you feel about it now, more than a year later? What benefits have continued to emerge. When I came back, people said that I had grown. I think it has made me more confident and stronger (if I can do that, I can probably do anything …). The things that we touched on above about faith, trust and pace are also important and continue to emerge. I learned, and continue to learn, important lessons about my need to rely on God and others rather than myself; on the being realistic about possibility and its limits; and about what my limits are. Alan Ecclestone, A Staircase for Silence, DLT, 1977, p13. If you’re interested in the Camino de Levante, the Confraternity of Saint James has some good information. In Pomps, on the Chemin du Puy. Want to see your photo here? Submit it now. It seems I’m really committed to walking the Vía de la Plata this spring. I have finally have tickets! They’re from Toronto to London, which might seem odd, given that I live in British Columbia (three time zones away from Toronto) and am going to Sevilla. But I’m visiting friends near Toronto and Oxford on the way, so it actually makes sense. I just need to book a few more flights. Anyway, here’s the news I’ve found this week. The usual disclaimer: I’ve done the best I can to ensure accuracy, but a lot of this information comes from Spanish sites and my Spanish isn’t perfect. The Tribunal Superior de Justicia de Aragón (Aragón High Court of Justice) recently ruled that the “regrowth” of the Yesa reservoir is compatible with the protection of the Camino Aragonés, which passes through the area. It sounds like the development of the reservoir will mean modifying the current Camino route. I would like to look into this issue more in the future when I have time to struggle through the Spanish, but here’s what I know. I’m being as accurate as I can manage, but can’t make guarantees. According to the cleverly named YESA NO site (scroll down for English), in addition to displacing local residents and causing social disintegration, the growth of the reservoir will threaten a number of archaeological and architectural sites along the Camino. I can’t tell if they’ll definitely be flooded, but the site seems to say so. Then again, the court ruling suggests a judge thinks otherwise. If anyone knows more about this, please do comment. The Mundicamino website now has a section on the Via Francigena pilgrimage to Rome, which is under construction. They’re asking for information and photos. The Spanish pages currently have the most information, and English pages just seem to be the Spanish pages run through an on-line translator. The new Libro de Piedra (Book of Stone) website gives visitors a virtual tour of the cathedral, its museum, and a few surrounding squares, with some information in Spanish. I thought it would be completely gimmicky, but it’s actually kind of fun. A little slow, though—at least with my computer. French statistics show that numbers of pilgrims/walkers on the Chemin du Puy are increasing. Numbers of pilgrims staying at the gîte communal in Arzacq-Arraziguet have risen from 2,147 in 2000 to 5,135 in 2010. According to the same statistics, 1.5 percent of pilgrims staying in that gîte walked for reasons of faith; 50 percent for the physical challenge; 30 percent to face a challenge with others (my translation may be a bit off on this one), and the remainder to live a new life, find companionship, change their outlook on life, or to meditate. It seems they’re asking different questions in France than in Spain. There’s definitely no “live a new life” box at Roncesvalles or at the Cathedral in Santiago. The Camino de Levante will soon be way marked as the GR-239 (an official European long-distance path) in Castilla y León. The route is already marked with yellow arrows, but local Friends of the Camino associations believe the GR designation will help get support and protection for the route at various levels of government. Burgos just celebrated its patron saint, San Lesmes Abad, a Frenchman who devoted much of his life to caring for pilgrims at the Monasterio de San Juan, where he was abbot. The celebration, which involves a religious ceremony, partying, concerts and other events, is always held on the Sunday closest to January 30. Several towns near Mérida on the Camino Mozárabe (from Granada) now have special signs for pilgrims. The signs give information on population, monuments, important phone numbers, and more. Streets along the route also now have ceramic tiles with arrows pointing the way to Santiago, and the towns have pilgrim information centres, usually located in the local town hall. Two sites on the Vía de la Plata—the “Country House” at Mérida and a Roman bridge over the Aljucén River—received funding for archaeological work through the project Alba Plata II. Some fragments of Roman milestones have been found in the area. I just had a great conversation with Canadian photographer Peter Coffman, who walked substantial parts of the Chemin du Puy and the Camino Francés with some serious camera equipment. He travelled with the late fiddler Oliver Schroer, who fiddled in churches and cathedrals along the way. I’ll post the interview next week, but if you’d like to learn a little more now, I’ve already raved about the album that resulted from Oliver’s fiddling and Peter’s photos. Just for fun, because it brought back memories, I’ll leave you with a video of cows on the Camino. This Week in Pilgrimage: A World Heritage Site in Danger? This Week in Pilgrimage: A New Italian Route? Comments Off on This Week in Pilgrimage: The Camino Aragonés in Danger? I passed innumerable fields of sunflowers on the Chemin du Puy around Moissac. Unfortunately, I was a little too late in the season, and most fields had either dying sunflowers, headless sunflowers, or the dead remains of sunflowers. So it was very exciting to come across this field of blooming sunflowers. If you have a photo you'd like to see here, please get in touch. The usual disclaimer: I’ve done the best I can to ensure accuracy, but a lot of this information comes from Spanish sites and my Spanish is, alas, far from perfect. So here’s what I’ve found this week. As always, please write if I’ve missed something. A new bridge on the route between Finisterre and Muxía has made walk safer. Previously, the dangerous river crossing on sometimes-submerged stepping stones discouraged some pilgrims from walking the route. The Archdiocese of Santiago recently held a mass in honour of the pilgrims who died on the Camino in 2010. You can visit this link for more information on the pilgrims and their deaths. I just learned about the Caminho da Fé, a pilgrimage route in Brazil that was inspired by the Camino de Santiago. Pilgrims follow yellow arrows along the approximately 400-kilometre route, which has a variety of starting points, and ends in Apareceda. The Apareceda basilica houses Our Lady of Aparecida (Nossa Senhora Aparecida), Brazil’s patron saint. As of tomorrow (January 22), there will be a donativo refuge in Alcalá de Guadaíra, on the Cádiz extension to the Vía de la Plata. It’s 1.5 kilometres off the highway. This is apparently the first refuge to open on the route from Cádiz to Seville. For some reason this news really makes me want to start the Vía de la Plata in Cádiz, but I suspect that’s impractical. The Camino de Levante seems to have been more popular than ever in the last year. The number of pilgrims who stayed in the Ávila refuge increased by 60 percent from 2009 to 2010. Almost 85 percent were men, and the majority were Spanish, followed by French pilgrims, Germans and Italians. Nearly 54 percent arrived on foot, and close to 45 percent were cyclists. I wonder if the huge increase is related to the Holy Year, or if it’s at least partially a sign that the route is becoming more popular. Samos Abbey, which is on a variant of the Camino Francés, is going to house an ethnographic museum about food along the Camino. (You have to scroll down to find the story—the site doesn’t allow links to specific pages.) The museum will have photos, recipes, products for purchase, and more. Apparently there’s controversy around Santiago’s new City of Culture, which I mentioned last week. To learn more, visit the link, which is to an article in English. (Via Falcon269.) If you’re interested, you can a virtual glimpse of the City of culture through this video. Martin Sheen and Emilio Estevez are going to write a joint memoir called Along the Way, which is scheduled for publication in June 2012. It sounds like their time on the Camino Francés while filming The Way will be a central part of the book. For the ninth year running, crowds gathered in the ruins of the Hospital de Peregrinos de San Antón to celebrate the festival of Saint Anthony. (The Camino Francés passes through the ruins just before Castrojeriz.) A priest celebrated mass, and after the Eucharist he—as part of an old tradition—blessed the animals in attendance, which included rabbits, dogs and goats. The modern ritual is based on a 1745 text that outlines the blessing ceremony as practiced by Antonian monks for centuries. Those of you who understand French (it’s too fast for me) might be interested in this YouTube video about a group of people who are helping a paralyzed man get to Santiago. He’s on what looks like a stretcher mounted on a single bicycle wheel. Next week, I’ll post the story on the Springfield High School students who are planning a walk along the Camino Francés this summer. I’ll also be talking with Brandon Wilson about his book Along the Templar Trail and the pilgrimage route to Jerusalem that he hopes others will travel. I should be able to post the interview relatively soon. And Andy from Pilgrimpace’s Blog has kindly agreed to an e-mail interview on walking the Camino de Levante and his experience of how “the walking becomes the praying.” We should have that ready for you within the next few weeks.